In year 2000, leaders of rich and poor nations pledged to build a better world by 2015. Among their key goals now called Millennium Development Goals: halving extreme poverty and hunger from 1990 levels, reducing by two-thirds the child-mortality rate and slashing maternal mortality by three-quarters and achieving universal primary education. The good news is that the share of people living on less than $1.25 a day seems on track to meet the goal of halving the extreme poverty rate. However, the bulk of those gains have occurred in China and other East Asian countries. In fact, East Asia, Southeast Asia and North Africa are all on track to achieve almost all of the MDGs by 2015, but South Asia and the rest of the developing world have made insufficient progress so far, according to the current assessment by UN agencies. With South Asia as the region with the largest share of the one billion global poor, the world will not meet its targets unless there is much greater focus and strong commitment to meet MDG goals in India, Pakistan and Bangladesh. In fact, even South Asia has a better chance of meeting the poverty and hunger reduction goals excluding India. Let's discuss the status of South Asian nations to assess where they are and what needs to be done. India alone has the world's largest population of poor, hungry and illiterate people living within its borders. A new multi-dimensional measure of poverty confirms that there is grinding poverty in resurgent India. It highlights the fact that just eight Indian states account for more poor people than the 26 poorest African countries combined, according to media reports. The Indian states, including Bihar, Uttar Pradesh and West Bengal, have 421 million "poor" people, compared to 410 million poor in the poorest African countries. On poverty in Pakistan, World Bank economist Sanket Mohapatra has said in a recent post that remittances by overseas Pakistanis have played a significant role in Pakistan's economic improvement. Not only have such remittances contributed to significant poverty reduction in Pakistan "by an impressive 17.3 percentage points between 2001 and 2008 (from 34.5 percent in 2001-02 to 17.2 percent in 2007-08)", but "continued strong growth in worker’s remittances in the past few years has also contributed to improvements in the external current account balance” and “have facilitated improvement in the country’s external position”, according to a World Bank report released on July 30, 2010. There are now fears, however, that some of the gains made in poverty reduction have reversed due to widespread devastation in massive floods and Pakistan's economic woes since 2008 for which the poverty rate of 17% was reported by the World Bank. Thousands of schools and clinics have been destroyed in the recent deluge, setting back Pakistan's efforts toward meeting health and education related millennium development goals by 2015. In addition to lagging in poverty reduction, South Asians are also doing poorly in terms of hunger and health indicators. According to a recently-released FAO report's highlights as published in The Guardian, there are 847.5 million undernourished people in the world. India tops the list with 237.7 million, followed by China with 130.4 million, Pakistan 43.4 million, Democratic Republic of Congo 41.9 million, Bangladesh 41.7 million, Ethiopia 31.6 million and Indonesia 29.9 million. A recent report by World Health Organization (WHO) claims that India accounts for most maternal deaths in the world, with at least 63,000 such deaths taking place in 2008 alone. In fact, India fared worse than even Nigeria (50,000 maternal deaths in 2008), Congo (19,000), Afghanistan (18,000), Ethiopia (14,000), Pakistan (14,000), Tanzania (14,000), Bangladesh (12,000), Indonesia (10,000), Sudan (9,700) and Kenya (7,900). An estimated 65% of maternal deaths globally occurred in these 11 countries in 2008, with India contributing the most. As South Asians lurch toward the 2015 deadline for meeting the MDG goals, it is important to recognize their governments' role and the need for help from rich donor nations to significantly increase spending on human development for poverty reduction. However, the South Asian governments alone can not do it. The private sector organizations, NGOs and civil society have to come forward to make their contribution toward meeting the important MDG goals to reduce poverty and hunger and improve health and literacy. In Pakistan's case in particular, the overseas Pakistanis and Pakistan's middle class need to step forward to do their part in rebuilding the shattered lives of millions of their poor fellow citizens affected by the recent floods. Can Global Pakistanis Invest $10 billion in Reconstruction? Although I am not sure about your motivation, I am glad that you are highlighting issues that India needs to address. Working for the BJP party we are quite aware the high amount of corruption in the Congress led government. In fact, many of the mid level Congress officials were "discarded" BJP members who did not abide by BJP's high moral aptitude. It is accepted that during BJP time corruption went down (Transparency International) and the poor were directly benefiting by the social programs. Gujarat state did not have high literacy numbers like Kerala, but the gains have been impressive ( 55% to 70% today). Relatively many of the poor unlike UP or Bihar have upward mobility compared to 10 years ago (Times of India. Business and economy wise it is the most forward state in India. I think Indians know this. BJP chances are looking good! Regardless on N Modi's colorful views of Muslims one cannot deny he is a terrific administrator. Other states have a lot to learn from Gujarat. 1. On World Hunger Index, Gujarat fares worse than poor Haiti, according to India's State Hunger report. The first India State Hunger Index (Ishi) report in 2008 found that Madhya Pradesh had the most severe level of hunger in India, comparable to Chad and Ethiopia. Four states — Punjab, Kerala, Haryana and Assam — fell in the 'serious' category. Gujarat, 13th on the Indian list is below Haiti, ranked 69. The authors said India's poor performance was primarily due to its relatively high levels of child malnutrition and under-nourishment resulting from calorie deficient diets. 2. India's planning commission deputy chairman Montek Singh Ahliawalia says that the Infant Mortality Rate declined by only 10 points in Gujarat against the all-India level of 13 points. Similarly, its Maternal Mortality Rate declined by only 12 points against the all-India level of 47 points between 2001-03 and 2004-06. “This is clearly a matter of great concern,” Ahluwalia said. “The state is also facing a shortage of human resources for healthcare for most categories of health workers as out of 7,274 sub centres in Gujarat, 869 were functioning without Auxiliary Nurse Midwife while 6,405 centres were functioning with one ANM,” Ahluwalia said. The Plan panel Deputy Chairman also expressed concern over the lack of development in the tribal-dominated Dangs area in central Gujarat and asked Modi to furnish an update on what efforts were being made by his government to ensure its upliftment. Recent reports had highlighted how Gujarat has been slipping in terms of human development index. The state that used to rank fourth in the country has been going down to the sixth spot. An estimated 56% of the state’s children still suffer from malnutrition. there are lies damned lies and statistics. Visit Gujarat then tell me. As per statistics kerela is the best place to live but keralites constitute 90%+ of low end Indian labour in the gulf and make up a huge chunk of internal migration. Down with our stupid lame duck PM! anon: "there are lies damned lies and statistics." You want us to believe BJP's self-serving propaganda and discard World Hunger Project data and the Indian Planning Commission official data? How ridiculous! India has the largest number of foreign migrants in the world. It is helping hold up places there too. In fact in HDI leader Kerala they are main source of income. What disturbs me about India is what I learned from an ADB paper and that is that tax collection has gone down in this book period. 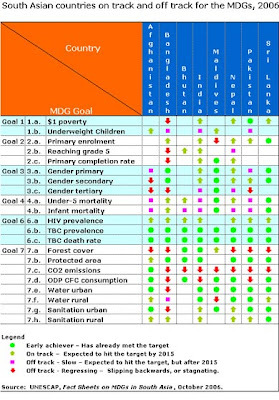 If that is the case how can MDG goals be reached? Tax collections should have gone up. I am also very disturbed by what I read about the Indian state of Punjab. It is facing catastrophe from different angles and the govt seems to be out to lunch! Water is going down, power sector is in deep mailaise, excessive fertilizer usage is causing cancer because it is ending up in drinking water,infrastructure is deteriorating, the state is de-industrializing, and on top of that 75% of population are drug addicted! I am also disturbed by reports of how inadequate bureaucracy is being in receiving and organizing flood refugees coming to Karachi. If it is so inadequate in Karachi, it must be truly pathetic in other places! The best news from Pakistan is how media has opened up. A friend in Lahore has told me it has raised the awareness of the people. She says there is even a satiric show called Alif and Noon about Asif Zardari and Nawaz Sharif! Mayraj:"India has the largest number of foreign migrants in the world. It is helping hold up places there too. In fact in HDI leader Kerala they are main source of income." In terms of the proportion of migrant population and foreign remittances as percent of GDP, Bangladesh is the leader in South Asia, followed by Pakistan. Like people in many developing nations, Pakistanis also see foreign remittances as a lifeline for the poor...with the poor provinces relying more heavily on remittances to supplement their incomes. Maybe generally;but, not specifically. I think some states in India could match Bangladesh and Pakistan. I think reactionary types in Kerela (like the ones who cut off a Christian Professor's hand) have been infected by ME's reactionary Islam. I was hoping Govt would make these people pay for his surgery or artificial limb. The state needs to guard against this reactionary influence. Mayraj: "Maybe generally;but, not specifically. I think some states in India could match Bangladesh and Pakistan." I agree. Kerala has about two million people working overseas out of he total state population of about 30 million, according to BBC's Soutik Biswas....two orders of magnitude higher proportion (66 per 1000) than either Bangladesh (0.65 per 1000) or Pakistan (0.5 per 1000), according to Nationmaster. That may be why Kerala has much less poverty and much higher social indicators than the rest of South Asia. The state has witnessed high amount of poor wage seekers from Bihar, MP and UP. Estimates are 500k to 20lakhs. Montek is a smart fellow but he works for the wrong party(congress). Riaz, you are naive about the inner working politics and it shows that you have cited data which many congress people do. We are in the "trenches" and we see how the poor are doing better in BJP states than congress states. "In fact, even South Asia has a better chance of meeting the poverty and hunger reduction goals excluding India." What rubbish. The fastest growing country in South Asia has a lesser chance of eradicating poverty or lessening it? Do you realize its booming here in India, atleast where I stay in Bangalore. TCS, India's top recruiter's, hiring pattern have changed due to many openings going unfulfilled. Such is the demand in India. India is on its way to achieve the fastest growing country crown in 5 years. I know ,I know ,your usual charge of only the elite are being benefited. But, such high growth cannot happen is the middle and the lower-middle class dont participate. "In India, the number of such people living on less than $1.25 a day is expected to go down from 435 million or 51.3 percent in 1990 to 295 million or 23.6 percent by 2015 and 268 million or 20.3 percent by 2020. " anoop: ""In fact, even South Asia has a better chance of meeting the poverty and hunger reduction goals excluding India." What rubbish. The fastest growing country in South Asia has a lesser chance of eradicating poverty or lessening it?" Go read the UN MDG report 2010. Specifically look at the charts that show Southern Asia's performance with and without India. In each case, the probability of hitting the MDG goals in 2015 improves in South Asia excluding India. For example, look at the bar chart on page 6 on halving poverty. With India, Southern Asia shows 49% poverty in 1990, going down to 39% in 2005. Without India, the bar shows 45% poverty in 1990 going down to 31% in 2005...which is much closer to the 2015 target. 2005 was 5 years ago incase you haven't noticed the Indian economy grew at around 9% pa in the past 5 years and the Pakistani economy around 4-5% pa as there has been near zero growth in the last 3 years.What's more these trends are likely to continue for the next 5 years i.e India will ,even with the most optimistic pakistani projections, grow 3-4% faster than Pakistan and has a lower birth rate so in per capita terms will grow 5-6% faster. 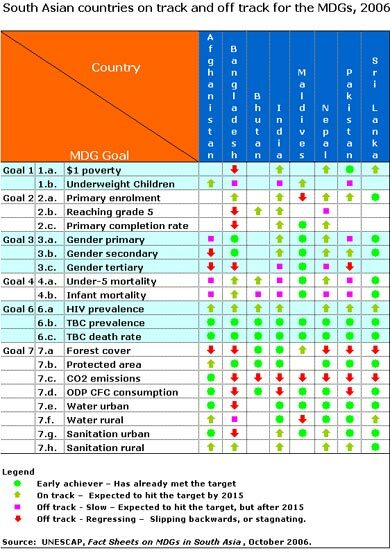 So I would like to know exactly how can you logically state that in 2015 Pakistan will likely be in a better position MDG wise than India??? Lot of data that was collected in Pakistan excludes FATA and NWFP areas due to security issues. Pakistani army did not allow any foreigners or Pakistanis from other regions (very few journalists were allowed). This was in the Army's manifesto as released to the US and is well documented. Therefore, the data that you're citing excludes these regions where poverty and illiteracy are endemic. This is a well known fact at the UN. anon: "2005 was 5 years ago incase you haven't noticed the Indian economy grew at around 9% pa in the past 5 years and the Pakistani economy around 4-5% pa as there has been near zero growth in the last 3 years.What's more these trends are likely to continue for the next 5 years ...."
First, high growth rates in India have not translated into large improvements in social indicators....the inequities have grown over the last two decades as measured by Gini index. Second, the most recent World Bank data released July 30, 2010 shows that poverty decreased in Pakistan to 17% by an impressive 17.3 percentage points between 2001 and 2008 (from 34.5 percent in 2001-02 to 17.2 percent in 2007-08)" while it increased in India to 37.2 percent of the population from 27.5 percent since 2004 (Indian Planning Commission 2010). chaitanya: "Lot of data that was collected in Pakistan excludes FATA and NWFP areas due to security issues." You are talking about a problem that exists in may nations of Asia and Africa, including India. It is conservatively estimated that Maoists, also known as Naxalites, control almost 25% of Indian territory in eastern and central states....these are some of the poorest and most backward areas in India. Indian defense analyst Bharat Verma claims that "New Delhi and the state capitals have almost ceded the governmental control over 40 percent of the Union's territory to the Naxalites". A Newsweek story last year quoted Deepak Ambastha, the editor of Prabhat Khabar, a Hindi daily newspaper in Jharkhand state, as saying that "the state's writ runs only within city limits." Similar situation exists in many of the 20 Indian states, home to nearly 80 percent of those 836 million Indians, where the Maoists dominate the rural landscape. The Central Government have permitted foreign workers(UN) to document the demographic changes so that it will help(on the directive of PM Manmohan Singh) address the issues affecting the Naxalites - poverty and landlessness. You're incorrect when you indicate that India has areas which have been excluded. Once again this is also well documented. Since the early days of census the founding fathers and mothers instituted a system of social inclusion as far as census and related data is concerned. You may say what about corruption? No business was conducted here so there was no profit motive(actually a little - read on). Leaders of social groups, tribal heads and Panchayats are incorporated to do the survey. Their SIZE was verified by the neighbouring village etc. and accordingly representation at the taluka and district level is given. The features of the census, gathering of data and statistics has been admired by the UN and US! The unfortunate problem with the naxalites have been landlessness and poverty. Moderate naxalites (those tribes that have renounced violence) are given self-sustaining agro-ventures like chicken coops and dairy farming to alleviate poverty. The country-wide poverty data is skewed because of this inclusiveness. MP, Orissa, Bihar, parts of W Bengal and UP account for the majority of the poor. This is the region where naxalites are active. Chaitanya: "The Central Government have permitted foreign workers(UN) to document the demographic changes so that it will help(on the directive of PM Manmohan Singh) address the issues affecting the Naxalites - poverty and landlessness." But Manmohan Singh's govt has no state presence and no writ in large swaths of India, according to Berkeley Political Science Prof Pradeep Chibber. In a lecture at the Indian community center in Silicon Valley in 2008, Prof Chhibber went on to ask the rhetorical question? Can a democracy exist where the state doesn't exist? Chibber explained that the Indian democracy faces two key challenges. The first challenge is the complete absence of the government or state in large swaths of India. The second challenge is that the government often acts in inconsistent and arbitrary ways where it does exist. He went on to say that, in some parts of Chhattisgarh, the government relies on private militias to act on its behalf. He also acknowledged the existence of corruption and criminal elements among the politicians in India. He said about a third of Indian legislators have criminal records. Did you notice that the study reported by The Telegraph was sponsored and funded by Mumbai municipal authority to deflect negative attention from Dharavi? The fact is that Orangi is nothing like Dharavi in terms of the quality of its housing or the services available to its residents. This report appears to be nothing but a shameful attempt by Mumbai's municipality to hide its own inadequacies by diverting the attention of the world to the biggest city of India's neighbor and arch rival Pakistan. What is even more disturbing is how the UNDP has become a party to this misleading claim. This preposterous claim is also an insult to the memory of Dr. Akhtar Hamid Khan who organized Orangi Pilot Project (OPP) and tirelessly worked with the residents on self-help model to improve their lives. While Dharavi has only one toilet per 1440 residents and most of its residents use Mahim Creek, a local river, for urination and defecation, Orangi has an elaborate sanitation system built by its citizens. Under Orangi Pilot Project's guidance, between 1981 and 1993 Orangi residents installed sewers serving 72,070 of 94,122 houses. To achieve this, community members spent more than US$2 million of their own money, and OPP invested about US$150,000 in research and extension of new technologies. Orangi pilot project has been admired widely for its work with urban poor. Mr Riaz, your current poverty figure as established by GOP is nearly 40%. you can check the government's website. As for India's 37.2 you did not enumerate the fact that we have changed the scale of poverty which will also include spending on health, education, housing along with food. It is not based on $1 or $2/ day. Check your facts first. If you want to even know more. Check Dawn paper of last month. They say 75% of pakistan's population lives under 2$/ day. Rahul: "As for India's 37.2 you did not enumerate the fact that we have changed the scale of poverty which will also include spending on health, education, housing along with food. It is not based on $1 or $2/ day. Check your facts first." No, you are wrong. India's poverty line is very very basic...it defines the inability o afford one square meal a day as poor. Based on income of $1.25, it would be worse than reported figure of 37%...and based on $2, the poverty in India is at 76% vs 60% in Pakistan. As to Pakistan's poverty figures based on $1.25 a day, I rely on World Bank and UNDP because they use data based on extensive work by surveyors and researchers in Pakistan working at the Center for Poverty Reduction in Islamabad. The 17.2% poverty figure reported by the World Bank on July 30, 2010, came from CPRSD. As for Pakistan the figures I reported were also taken from WB. And your 17.2 figure is so wrong. Its actually approx 40%. Rahul: "According to that if you convert that in dollars it is much higher than the 1.25& line adopted by world bank. But it is not taken in that way because it is taken on the spending power of the person rather than the income"
There are various methods used to define poverty, and these are all included in the Oxford Multi-dimensional poverty index (MPI) reported recently. Pakistan has slightly less poverty than India because ~90% of the population lives in Punjab and Sindh areas which have always been self sufficient in Agriculture and relatively prosperous.India's north west which historically has been similarly blessed is much richer than Pakistan. India's big problem is UP and Bihar two gigantic basket case sub economies which have 30% of the country's population.Take these out and the country outperforms Pakistan(minus NWFP and balochistan) by miles. Indian Punjab has a yield/hectare 4-5 times of Pakistani Punjab due to increased mechanization, superior seeds and fertilizer subsidies.It is in per capita terms twice as rich. Please google nominal state GDP per capita of Indian Punjab. Your figures are totally wrong. I have checked the world banks website and theres no mention of 62%. I have checked the report of Pakistan's newspaper DAWn and they clearly say 75% which is going to increase because of the recent floods. Sometimes debate on infra... to. Remember nations are not judged on poverty but the infra. they provide. Rahul: "I have checked the world banks website and theres no mention of 62%." I am not sure where you looked. You can find under $2 figures for both India and Pakistan from UNDP HDR 2009 and ADB's Report on Asia's Middle class. Both of these reports show that 60.3% of Pakistanis and 75.6% of Indians live on less than $2 a day. Rahul: "Sometimes debate on infra..."
I have written several posts and shared several reports from Reuters, Wall Street Journal, the Hindu, etc. on infrastructure. Pakistan's road, air and telecom infrastructure are far superior o India's, but India has a better railway infrastructure. Pakistan's road, air and telecom infrastructure are far superior o India's, but India has a better railway infrastructure. Really ? Have u had a good look at the new Delhi, Mumbai, Hyderabad, airports? How many passengers and cargo do Pakistan's airports process? What are the number of aircraft that currently serve Pakistan's domestic market? except the fact that Pakistan has 63% mobile penetration vs 57% in India what other evidence do you have to substantiate this assertion. The per capita usage,ARPU,quality of service and affordability of internet is superior in India. for eg a 4MBPS unlimited plan costs INR 500/month.A similar plan in Pakistan costs PKR 2000 so approx INR 1000. Pakistan has one single submarine pipeline connecting it to the rest of the world making it very vulnerable to it snapping. Pakistan has zero manufacturing of cellphones and optical fibre switches etc in its territory whereas India except Network routers ,in which it embarrasingly is totally dependant on US/EU/China,is self sufficient in most of the rest of the telecom value chain. Yes you could argue a lot of the sub assemblies of cellphones etc are imported but even China imports on average 30-50% of the net content of a phone in manufactures. We are building 16 kms of class A highways everyday I don't see this lag lasting for very long. Yes I know i know the M2 motorway rocks but that was built a long time ago. anon: "Have u had a good look at the new Delhi, Mumbai, Hyderabad, airports?" Yes, I have...except the latest terminal in New Delhi. I bet you haven't seen Karachi, Lahore and Islamabad airports. Read the impressions of foreign visitors such as William Dalrymple, Yoginder Sikand, Hindol Sengupta, and many others. except the fact that Pakistan has 63% mobile penetration vs 57% in India what other evidence do you have to substantiate this assertion." Pakistan has higher teledensity and higher percentage of population with Internet access. India 7% and Pakistan 11% according to ITU data. anon: "Pakistan has one single submarine pipeline connecting it to the rest of the world making it very vulnerable to it snapping." Pakistan now has multiple submarine and satellite connections to the Internet. anon:"Pakistan has zero manufacturing of cellphones and optical fibre switches etc in its territory whereas India except Network routers ..."
India is heavily dependent on China for imports of power and telecom equipment, running huge trade deficits. New Delhi: A more inclusive growth policy targeted at marginalised communities and protection of their basic rights is required to combat hunger in India, international NGO ActionAid said. "The dark side of India's economic growth is the fact that the poor have been dispossessed further, leading to malnutrition, hunger and starvation deaths," Sandeep Chachra, executive director of ActionAid India said here. The International Food Policy Research Institute has ranked India 67th on the global hunger index, way below its neighbours China and Pakistan. In a hunger score card released before the Millennium Development Goals Summit at the United Nations headquarters at New York in September, ActionAid said that while India's per capita income had tripled between 1990 and 2005, the number of chronically hungry had not reduced, standing at a staggering 270 million. At this rate, India cannot halve its number of those starving until 2083, the report said. "Implementation remains a massive challenge. Food and other entitlements have to be delivered on the ground, which requires greater political will," Amar Joyti Nayak, thematic head for food rights for ActionAid India, said. One little noticed story of 2010 was that five more developing countries officially lost their "poor" status. When the World Bank carried out its annual reclassification in July, Senegal, Tuvalu, Uzbekistan, Vietnam and Yemen all graduated to middle-income status – countries that have reached the $1,000 (£644) or so GDP threshold. Taken by themselves, not big news perhaps, but add to that 22 other countries which, since 2000, are no longer considered officially poor, then a quite profound global change is under way: in short, most of the world's poor no longer live in "poor" countries. China was upgraded in 2001 (based on 1999 data) and India, Pakistan, Nigeria and Indonesia are among the other states that have become middle-income countries (MICs). Only 39 states are still considered to be low-income countries (LICs). As we enter 2011, it is likely that more will follow. Ghana, for example, looks set to graduate in 2011, particularly in light of its new GDP figures unveiled last month. The country will join Senegal, Cameroon, Angola and Sudan, which are among the growing number of African MICs. On the other hand, given the lingering reverberations of the global economic crisis, there is also a risk that some countries might drop back under the threshold, slipping once again into low-income status. Pakistan or the Ivory Coast might have cause for concern in 2011, for example. On the whole, this is a good news story, but with an underside. Yes, there are fewer poor countries but poverty remains high in terms of absolute numbers in the MICs. The news raises some pressing and difficult questions for aid and development policy. As developing countries get wealthier and are reclassified, many are still characterised by persistently high levels of poverty. Indeed, roughly three-quarters of the world's poor now live in MICs – 960 million, or a new "bottom billion". And this isn't just about China and India. Even if they are removed from the equation, the share of the world's poor living in MICs has still tripled since 1990. In light of the above, how should global poverty reduction be done differently in 2011? First, the LIC/MIC binary: If the focus is poor people not poor countries then the LIC/MIC way of looking at the world needs a rethink. The new UN multidimensional poverty measure might be one alternative tool. But there are many others. Second, the end of aid and the equity elephant: overseas development assistance (ODA) is becoming less important and equity more important. More equitable countries reduce poverty faster, and stubborn asset, gender or identity inequality (ie caste systems) might begin to explain persistent poverty amid wealth in the new MICs. This entails some thinking on what ODA is for. Any attempt to discuss inequality will be viewed as an infringement on political sovereignty but is domestic inequality solely a domestic issue if it hinders the effectiveness of aid? And could there be a case for a new multilateralism based on putting resources from donors and new MICs together? Keep an eye out in 2011: the fact that the world's poor are increasingly found in MICs has the power to shake up the entire aid and development industry. Seven UAE-funded hospitals and clinics will be built in Pakistan at a cost of nearly Dh63 million, Wam, the state news agency, reported yesterday. After a signing ceremony between Abdullah Khalifa Al Ghafli, director of Emirati projects to assist Pakistan, and Maj Gen Zahir Shah, commander of the GOC 45th Engineers Division of the Pakistani Armed Forces, it was announced that two hospitals will be built under the names of Sheikh Khalifa and Sheikha Fatima. Mr Al Ghafli said the UAE would also fund medical equipment for both hospitals and all of the clinics. The increasing number of healthcare projects in Pakistan was a sign of the strong co-operation between Pakistan and the Emirates, said Sheikha Fatima bint Mubarak, chairwoman of the General Women's Union and of the Family Development Foundation. "Pakistan was one of the first three countries in the world to recognise the UAE, following the declaration of the Union on December 2, 1971," she said. Sheikha Fatima said the active role the UAE plays in places of crisis was due to the generosity of the president, Sheikh Khalifa. In February of this year, a medical team from the RCA and 400 local volunteers initiated a programme to provide measles and polio vaccines to Pakistani children. The Campaign to Cure One Million Children, sponsored by Sheikha Fatima, also provided free medical treatment to more than five million children who suffered from malnutrition and digestive and respiratory diseases as a result of the flooding. The UAE ambassador to Pakistan, Eissa Abdullah Al Nuaimi, noted that last month a UAE-funded school for 400 pupils was completed. It will take 18 months to build the hospitals. Pakistan will not be able to achieve the Millennium Development Goal (MDG) 5, that relate to bringing about an improvement in maternal health, by the targeted year of 2015. This was stated by Special Adviser to the Prime Minister and Chairperson National Assembly Special Committee on MDGs Shahnaz Wazir Ali on Thursday. She was addressing participants at a National Policy Dialogue on Monitoring Implementation of MDG 5 in Pakistan at a local hotel. Ali said dictatorship, slow pace of work, lack of integrated coordination and planning between the federal and provincial ministries after the 18th amendment and unavailability of credible data on health and family planning are major factors behind the failure to achieve the set targets on time. She expressed concern over low prevalence of safe family planning measures which is one of the major reasons behind high maternal mortality rate in Balochistan despite heavy funding. Ali revealed that allocations under the NFC Award for Population Welfare were need-based rather than determined by population size and hoped that these would be used to promote maternal health. “Now the provinces have to come up with strategies to enable the country to achieve the targets. The federal government will, however continue to offer financial support,” she said. Presenting the findings of the research on progress achieved so far under the MDG 5, Khawar Mumtaz said that the maternal mortality rate (MMR) is 276 per 100,000 live births in the country which needs to be reduced to 140 by 2015. Similarly, contraceptive prevalence rate (CPR) is 30% which needs to be increased to 55% by 2015, while total fertility rate (TFR) is 4.1 live births per woman which need to be reduced to 2.1. In Balochistan, MMR is 785 per 100,000, CPR is 14%, while TFR is 4.1. Discussing the appalling situation in his province, Balochistan Health Minister Haji Ainullah Shams said the term family planning is taken as a plan for not having children in the province, which needs to change. Similarly the province is deprived of all basic health facilities and health officials who are deputed in the BHUs they are not given any incentives or facilities, he added. Meanwhile, Secretary Federal Bureau of Statistics Sohail Ahmed emphasised on the need for federal government to re-invent its role post-18th amendment for coordination of international commitments and to serve as a bridge between provinces and donors for achievement of MDGs. He suggested the federal government should offer matching grants to provinces for achievement of MDGs. Secretary of State for the UK’s Department for International Development, Justine Greening, is in Pakistan. She confirmed confirmed the UK’s commitment to help support four million of Pakistan’s children in school during a visit to two schools in Rawalpindi. Justine Greening said: “Education is the single most important factor that can transform Pakistan’s future. "Education helps to increase economic growth and will give the next generation of Pakistanis the chance to build a better future for themselves and their families. Over the next six years alone, UK support for the planned Punjab Education Sector Programme, working with government and other donors, will help an additional 2.9 million children gain access to education, 71 per cent of whom will be girls. Progress by the Government of Punjab has seen the primary enrolment rate for girls rise to 68 per cent (from 59 per cent) across the province, and to 64 per cent (from 55 per cent) in rural areas, between 2006 and 2010. In Khyber Pakhtunkhwa, the UK’s education programme is focusing on tackling the educational disadvantages faced by girls, providing monthly ‘stipends’ so that poor families can send their girls to school and helping them to stay longer by investing in secondary education facilities for girls schools. 400,000 girls received vouchers this year. And a new Education Fund for Sindh will educate 200,000 children through vouchers for low cost private sector schools, by working with organisations educating the poor and by supporting public private education partnerships. In its first year, the Education Fund for Sindh is already supporting the education of over 11,600 children. She also met with Minister of Finance Hafeez Shaikh. Justine Greening said: “I am pleased to be in Pakistan to see for myself the results that UK aid is helping to deliver in transforming people’s lives and to reiterate the close and enduring bond that our two countries share. The UK’s aid programme is linked to the Government of Pakistan’s progress on results and reform at both the federal and provincial levels, particularly following the upcoming elections. Discussions between the British Development Secretary and Minister of Finance focused on steps being taken to build a more dynamic economy, strengthen the country’s tax base and tackle corruption. That said, this is a worthy, high-minded effort. Developed economies like those of the United States, the European Union and Japan need to play an important role by providing more aid, expertise and private investment to developing countries. And industrialized nations need to revive their economies to help lift global growth, which the International Monetary Fund estimates will slow to 3.3 percent this year, from 3.4 percent in 2014. The Pakistan Education Statistics 2015-16 fact sheets compiled by Alif Ailaan shows that Pakistan failed to meet the Millennium Development Goals (MDGs) targets for universal primary school access, improving retention in schools and increasing adult literacy. The MGDs report available on its official page also revealed that not only did Pakistan come up short in upholding its international commitment to ensure all its citizens access to primary education as prescribed under the MDG, but it has also failed to meet its constitutional obligations at national and provincial level. The report of the MDGs has also recommended a high standard of education. The education departments of a country need to consider the urgency of improving educational quality in the country, which is not necessarily linked to infrastructure alone. According to Alif Alian, Provincial and National Education Scores For the fourth year consecutively, Islamabad has ranked highest amongst all provinces of the Pakistan. The Education Score of Khyber Pakhtunkhwa (KP) remained at the same ranks they were last year, with KP at number five. However, the provinces suffered a decline in their Education Score of almost two percentage points each. KP demonstrated improvements in both enrolment and gender parity scores. However the reduction in the overall Education Score of the province is mainly due to the decline in retention rates. The report of the independent organization also indicates that 50 percent of KP schools still do not have any of the four basic facilities available (electricity, drinking water, toilets and boundary walls). Unlike Punjab, KP’s districts are more evenly distributed whereby one specific region does not dominate the rest, as was the case in previous years. The Pakistan District Education Rankings 2016 have suggested that for the fourth annual iteration for tracking progress, three districts of the province - Malakand, Mardan and Haripur - ranked in the top 25 of the country. The data accumulation process of the organization found that two districts of the province - Tank and Kohistan - are ranked in the bottom 25. Kohistan was the worst performing district. However, as result of the Fiscal year (FY) 2016-17 KP the provincial allocation is PKR 43.6 billion while the district component is PKR 99.8 billion which will have a positive impact for the improvement of district level education status. Fifty percent of the provincial budget has been allocated for the districts but no detail or formula has been mentioned concerning how the funds are to be allocated. The minister made clear the formula or break-up of development and current allocations of funds to districts. It is pertinent to mention here that the factsheet praised the meritorious policy of Pakistan Tehreek-i-Insaf (PTI) in the previous FY 2015-16 merit base recruitment of over 12,000 school teachers through the National Testing Service (NTS) in FY 2015-16. Despite a five-year trend of increasing enrollment rates, many children are still out of school and gender disparity remains a challenge. 52 percent girls in the province remain out of school compared to 21 boys. Media Manager of the Alif Ailaan Mariam Jamal said, while speaking to Daily Time that the data presented in the factsheet was collected painstakingly at a district level and compiled at the provincial and regional levels from the Annual School Census (ASC), which is regularly conducted every year by provincial and regional Education Management Information Systems (EMIS). The United Nations is focused on supporting Pakistan to achieve the SDGs as efforts continue to tackle development challenges in the country under the UN Sustainable Development Framework. This was highlighted at the 6th Provincial Steering Committee meeting of the OneUN Operation Plan III (OPIII) that was held at the Planning and Development Department Secretariat in Quetta today. Sajjad Ahmed Bhutta, Additional Chief Secretary Development chaired the meeting. Co-chairs of the Balochistan Steering Committee, Neil Buhne United Nations Resident Coordinator and Minà Dowlatchahi, FAO Representative in Pakistan elaborated upon the approaches to align UN Sustainable Development Goals framework with the priorities of the government of Pakistan. Successes achieved over the last year were also presented to the participants which included high level officials from various government departments in Balochistan. Pakistan is amongst the first countries that adopted the SDGs as National Development Goals and one of the few countries that is investing its own resources to achieve the SDGs. The 5-year partnership framework sets out the direction of the UN’s support to the government of Pakistan to achieve the 17 Goals of the 2030 Agenda for Sustainable Development Goals.